Pubs operating Late bars have become increasingly popular in Galway and throughout Ireland over the last 10 years due to changing licensing laws and changing social habits. They offer an alternative to the nightclubs and often feature DJ's and dance floors. 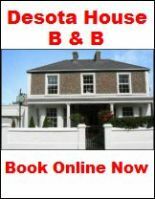 Normal Pub opening hours are 11.30pm Sunday to Thursday and until 12.30am Saturday & Sunday. The Front Door is a very popular venue. Accommodating up to 500 people it is in the super pub league. Three bars over two floors with DJ's and a dance floor. Famous Live music venue. Large Pub with probably one of the biggest smoking areas in town. Great club alternative. The Skeff is one of Galway’s biggest pubs reputedly accommodating up to 1500 people on it’s several levels. Extremely popular with large groups at the weekend. 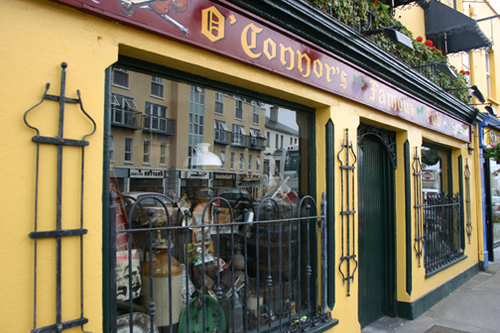 Situated in the west end of Galway City it has a stylish spacious interior with lots of comfortable seating and even a small dance floor. Diverse range of DJ's and bands throughout the week. 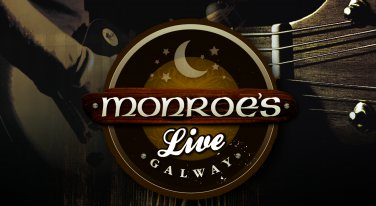 Two bars with live music most nights. Downstairs venue operating as a Club on Saturday nights. Popular with an older clientele at the weekends. Located right in the heart of the City. DJ's and bands pump up the pre-club crowd but gets quiet from 1am onwards. 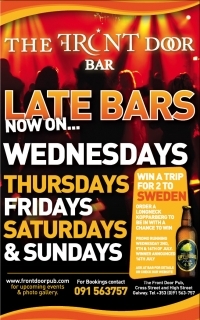 Open until 12.30am on Thursday & Sundays but goes late 4 nights a week during the Summer. Opening late several nights a week. The upstairs venue features covers bands most nights but charges a cover charge. American themed bar and club popular with students during the winter and weekend revellers. The crowd is generally under 25 with Fibbers being popular among college students for its cheap drinks and loud music during the week. 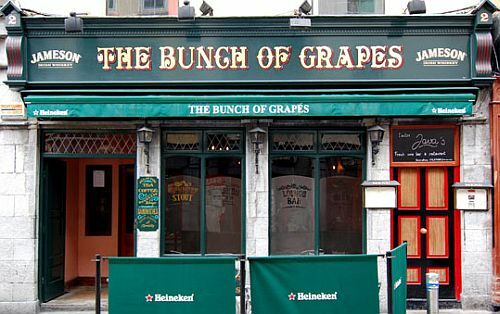 One of the first pubs to open a late bar in Galway. Part of the Foster Court Hotel. DJ's at the weekend.